﻿ Dog Named Banjo » Lookit What I Got!!! I never thought it would happen. I have a new sewing machine! 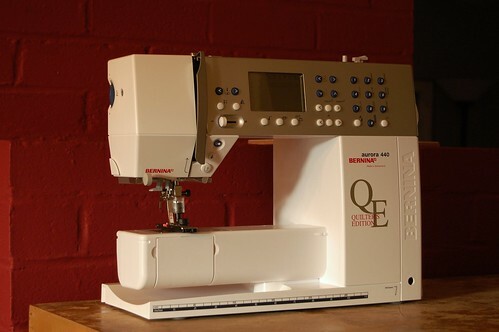 It’s a Bernina 440QE! It is lovely and beautiful and sturdy and smooth. I am officially in love. Stay tuned for a few posts on my search experience, as well as more info on the machine itself. I hope to do a lot of mini feature reviews so that others can benefit from some info out on the Interwebs that I was unable to find throughout my search. Yippee! Kristines last blog post..Healthy Machine = Time for a Giveaway! Yes! That’s exactly right – a graduation present 🙂 I love it so far! Lost my 440qe instruction manual and can’t thread the darn thing. Do you have instructions you can share? I have been keen to buy this machine for a long time and have been very encouraged by your blog, which I have shown my husband from time to time. We have now put one on layby (Australian term – not sure if you use it in the US). I am very happy. Looking forward to collecting when we have paid it off. I am upgrading from my 1977 Bernina 830 to this machine TOMORROW! I had the full demo yesterday and have been slobbering all over the website and your blog since then…can’t wait for the Bernina dealer to open tomorrow morning at 9:00! Since taking up quilting, I have more use for the quilting features than ever before and I’m convinced that I’ll be making another lifetime purchase, just like the original 830. I’m not getting rid of my 830, though…just putting it out to pasture for awhile — maybe handing it down to a deserving granddaughter in time. Thanks for this excellent blog, which confirms my decision to move up the ladder a bit in the Bernina line. My 830 was top of the line in 1977, but new technology and new interests have let me reconsider what’s currently available. Thanks, also, to Bernina for continuing to make a quality product. I’ve always been happy with Bernina. Sewed an awful lot of my girls’ clothing on my old 830. Now I can sew more for fun…with my quilts and such. You sold me on the Bernina 440QE, but they no longer sell them so I got the Bernina 450. Hopefully they are close to the same thing so I can continue to use your blog. Thanks for the tutorial. I learned more than I learned at the dealer where I bought my machine. I learned to clean it right and how to use my BSR. I had no idea it had 2 modes. i have owned the machine for several years. i hope to learn to use the embroidery thing my husband encouraged me to buy,but have never tried. I am very pleased to have found this site and hope you continue to post on it.